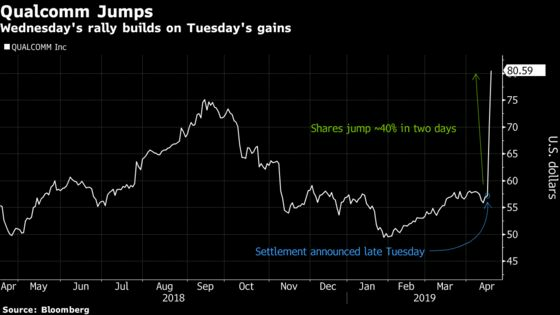 (Bloomberg) -- Qualcomm Inc. jumped 14 percent to continue a two-day rally of about 40 percent after announcing a settlement with Apple Inc., and signing a deal for royalties and chipsets with the iPhone maker to end the two-year legal dispute. Cassidy upgraded Qualcomm to buy from hold and says that based on management’s additional $2.00 earnings per share guidance, there will be no -- or only a slight -- discount to Qualcomm’s licensing fee once iPhones ramp into production with Qualcomm modems. "Qualcomm’s Apple settlement removes the biggest overhang on its stock and clears up its earnings-expansion potential ahead of the 5G ramp-up." "Fiscal 2019 EPS is likely enhanced by catch-up payments, and ongoing earnings may also be driven by royalty payments. Most importantly, Qualcomm’s royalty model will likely remain intact, and it may also supply chips to Apple, in a blow to Intel."